The windows around your property do more than paint a pretty picture. Each pane of glass around your property adds to the structural integrity of your home or business. Windows are important but they can often be ignored, forgotten or improperly cared for. By calling in the pros you can have your windows clean, clear and working for you. Our Mississauga window cleaning is only a phone call away! Having spots on your windows is a part of life but leaving bits of dirt and debris along window surfaces can mean more than an obstructed view. Glass might feel hard to the touch but it is a porous material. This means that over time, dirt and bacteria left on the surfaces of window glass can seep into materials and degrade them from the inside out. Over long periods, glass can break down and lead to costly replacement as well as an increased in household bills. In winter, heating costs can rise and, in summer, power costs go up in order to keep your space cool. Instead of causing yourself grief and costing money, call in our Gorillas to keep an eye on your windows. One of the most frequently asked questions for our technicians is, “why can’t I clean my windows myself?”. Well, the truth is that you could but you will not get the same results as our Gorillas. Our technicians learn all of the tricks of the trade with our in-depth training programs. 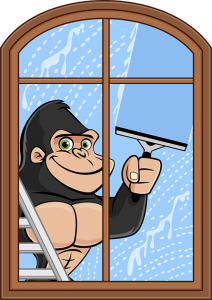 Instead of approaching our Mississauga window cleaning as just another chore, our Gorillas approach with precision. 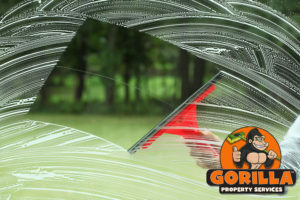 Using rubber squeegees and speciality eco-friendly cleaners, Gorillas clean every inch of glass as well as the space around them. Our practices eliminate increase static cling caused by friction as well as maintain the area around panes of glass so a full-service clean. Our services are always available to properties that are 4 storeys or under.